And now for something new. I recently asked Julie if I could review some products on her site and she agreed. So this is the first of the guest reviews. I got a sample of this powder in the Nike Run Remix race packet that I picked up over the weekend. It is the berry flavor one. It also comes in lime/lemon flavor. I read somewhere that Walmart is selling a box of 10 packets for $2.96. I have not personally seen them there myself for this price but I wasn't looking for them. I have heard that this item may be difficult to locate, so if you come upon this somewhere for a good price, please feel free to share. I like the idea of this product because they are portable. 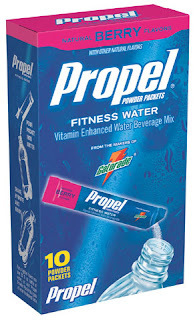 Propel fitness water is really refreshing, but I think it is only good for replenishments after short runs. I tested this out on a 5-miler yesterday and it was quite refreshing after my run. You just open the packet and pour into a 16.9 oz bottle of water and shake it up. It starts out kinda pink but eventually ends up clear if you shake enough. It is best cold, not so good when it has been sitting out for a while. I must say that it is very similar to the premade Propel water. All-in-all it was good, I may pick up a box if I happen to see them in a store but I will not be going out to look for them specifically. I love those Propel fitness water packets. They taste so refreshing! I wonder a little about how good they are as 'fuel' because they only pack 10 calories (I think), but they taste awesome!